Read this – right after you get back from skiing! – NYSSRA Nordic Inc. There is a lot going on. This winter keeps flipping between arctic and balmy conditions. Our race calendar has adapted, and we have been able to pack in a pretty good season. In case you haven’t heard there is quite a bit left, and if you can you should hit the trail and join in. This winter will end eventually, so make the best of it while you can. Too Much is going on to spend time writing about it all. Make the time to compete for your Local Club this season. The points Series is tightening up. NYSEF And Rochester have dominated a few big races, but have not attended every race, allowing HURT, PERU, Saratoga, and GHN-ADK Vauhti to scoop up some points. Quick Recap: NYSEF Dominated at Gore. Rochester followed close behind. Aiden Burt and ANNA SCHRIEFER took top spots Saturday. Then Hazardous weather was not enough to stop the race Sunday. Not Surprisingly Paul Alison pulled off his third solid victory of the season, ADRIAN HAYDEN, Colton Martin, and ANNA SCHRIEFER, Marli Damp, and CAMERON MCDANIEL also took gold. After a weekend at Gore, jrs headed north to race an eastern cup and qualify for the JR trips. Doug Diehl won the Charles Lamandola Classic,and Matt Bellizi held of somebody who used to beat* Olympian Andy Newell for a decisive win in whiteout conditions at the rescheduled New Years Resolution Race. The Polar bear send out an army of U8, and U6 Bill Koch racers in a generous but ultimately futile effort to pack the trail. This weekend and Next there are Clinics being put on by NYSSRA’s southern Shwangunk club. – Sunday February 10th, 12-3pmAll ages are welcome, K-adult! Beginner to advanced skill levels.LOCATION: Mohonk Mountain House. – Park in the Gatehouse Parking Lot. – Tell the Attendants you are participating in the ski clinic and they’ll waive the parking fee and entrance fee. – Each participant will need to fill out Mohonk’s Assumption of Risk Waiver. For children under 18, a parent must fill out the form and sign it. 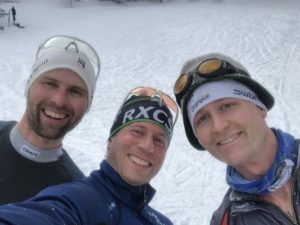 You can get the form ahead of time at skithegunks.com under the “Events” tab. Or fill it out when you arrive. 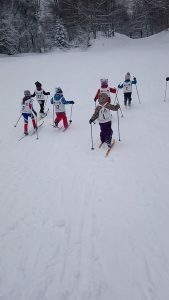 – Clinics will be held by the New Paltz and Wallkill Nordic Ski Teams, Parents, and members of the Shawangunk Nordic Ski Association. – Rent equipment at Rock and Snow in New Paltz for a discounted price of $10 for the day. Let them know if you are going to classic or skate ski. Skate style boots are limited. – You may bring your own equipment. ESWG Registration Deadlines So Much going on !